I'm not a real afficionado of chain maille, but once in awhile it's really fun to dabble in, especially when you can whip up a fast and easy (and super-cute) pair of earrings in almost no time! I'm not sure exactly what you would call this pattern of linking your jump rings: it is either a simple 1 x 1 chain with extra loops added to every other link, or it's a 3 x 1 chain without the second attachment for the outer rings of each 3. Does anyone know if this pattern has an official name? Anyway, it's easy to do, as I said, and you can be wearing new earrings in an hour. 1. 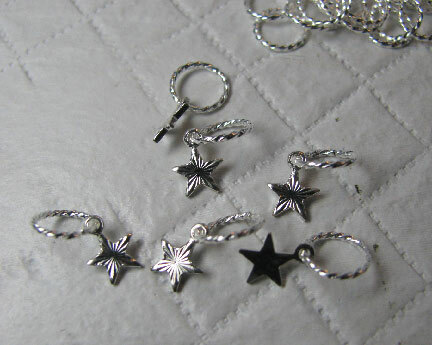 For each earring, pick up a drop on 6 jump rings, and close the rings. 2. Starting with 1 open jump ring with an ear wire on it, pick up 3 closed jump rigns, the outer ones with crops and the middle one plain. 3. Use an open jump ring to pick up the next three jump rings as in step 2, and attach it to the middle plain jump ring from that step. 4. Repeat step 3. 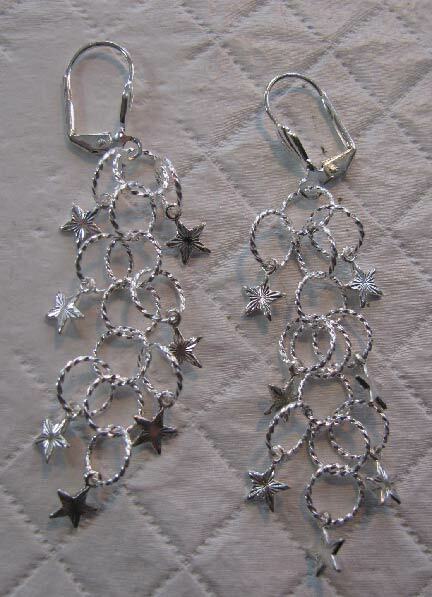 You can repeat as many times as you want to make the earrings longer, but I like them just a couple of inches long. 5. Add one more jump rign to the bottom, with a drop attached. Make the other earring the same way. As regards FTC disclosure guidelines: I have received some of the above products free of charge from Fire Mountain Gems in order to write a review and/or create a project free of charge for you. beautiful one!! thanks for sharing the tutorial..